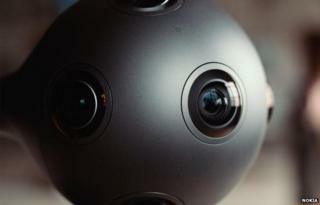 Nokia is developing a virtual-reality capture device that can record 360-degree views and "3D audio". The Ozo features eight camera lenses and eight microphones on a spherical-shaped body, from which a handle protrudes. The Finnish firm said that one advantage over existing systems was that it created footage that could be watched in real time via a VR headset. One expert said Ozo was not as big a leap for the firm as it might seem. "Nokia has a great deal of experience developing not only camera technology, but also the portability of camera technology," said Chris Green, a consultant at Davies Murphy Group. "The company was putting in high-end cameras on very small mobile phones and producing exceptional image results years before other manufacturers. "And it can now direct the knowledge it has to other sectors." Ozo was unveiled at an event in Los Angeles, underlining that the company plans to target it at Hollywood and other media professionals, rather than consumers. Nokia said the device was due to go on sale before the end of the year, but was unable to provide the full technical specifications or price. Nokia follows GoPro, Jaunt, Giroptic and Spherical in announcing a virtual reality recording device that is meant for "prosumers". The firm's pitch is that Ozo can not only provide live monitoring of footage via a compatible headset, but also allow playback of filmed material at low resolution within minutes of it being shot. "[It] removes the need to pre-assemble a panoramic image - a time-consuming process with solutions currently in the marketplace," the company said in a statement. One tech journalist who was given a preview of a prototype suggested the footage it produced was sometimes "muddy and out of focus" but praised the kit's audio-rendering capabilities. "I found myself constantly looking around in each clip, because the sound seemed to track my position," wrote Casey Newton for the Verge. "I would hear something behind me, and when I turned I would see the still-moving mouth of the person talking." Nokia also revealed that Jaunt would support its device, despite the Californian company offering a rival product of its own called Neo. Jaunt's investors include Britain's Sky TV and Google, and its president Cliff Plumer was an adviser to the Oculus VR headset's creators before they joined Facebook - making the firm well placed to capitalise on growing interest in VR. "Our partnership with Nokia is another big step for us to continue to provide our partners with the most cutting-edge technology to further cater to their creative needs," said Mr Plumer. Virtual reality is unlikely to become Nokia's main business. Earlier this week, the European Union approved the company's 15.6bn euro ($17.2bn; £11bn) takeover of Alcatel-Lucent, which will let it extend its share of the telecoms network equipment market. But Mr Green said Ozo still had the potential to develop into a sizeable business. "We know there is a market there - the fact VR cameras are already being used in professional film and TV production shows the importance they now have," he said. "There's room for lots more growth, and it's a logical market for Nokia to dabble in."